The simulated radio images in this not-to-scale artist's illustration show superfast jets blasting from the black hole created by the merger of two neutron stars, a dramatic event observed in August 2017. In the 155 days between two observations, the jet appeared to move 2 light-years, a distance that would require it to travel four times faster than light. This "superluminal motion" is an illusion created as the jet is pointed nearly toward the Earth; it is actually moving at about 97 percent light speed. 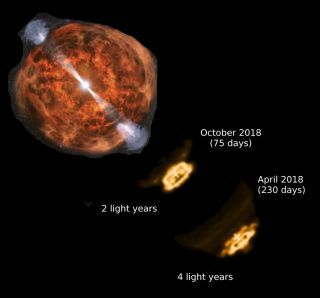 The dramatic neutron-star merger that astronomers spotted last year generated a jet of material that seemed to move at four times the speed of light, a new study reports. "Seemed" is the operative word here, of course; the laws of physics tell us that nothing can travel faster through space than light. So, the superluminal motion was an illusion, which was caused by the jet's (still very fast) speed and the fact that it blasted almost directly at us, researchers said. "But to match our observations, the material in the jet also has to be blasting outwards at over 97 percent of the speed of light," he added. Deller and his colleagues — led by Kunal Mooley, of the NRAO and the California Institute of Technology in Pasadena — used a variety of radio telescopes to study the aftermath of the neutron-star collision, a historic event known as GW170817. GW170817 was the first documented collision of two neutron stars, the superdense remnants of massive stars that have died in supernova explosions. GW170817, which occurred about 130 million light-years from Earth, also opened the era of "multimessenger astronomy": it was the first event ever detected via both gravitational waves (the ripples in space-time first predicted by Albert Einstein a century ago) and electromagnetic radiation. The name GW170817, by the way, is a nod to those gravitational waves, as well as the date astronomers observed the event — Aug. 17, 2017. Scientists think the merger generated a powerful explosion that ejected a shell of material far out into space. Inside this shell, the merged neutron stars created a single black hole, which began sucking up lots of gas and dust. This material formed a fast-spinning disk around the black hole; before long, twin jets began blasting from this disk's poles, research team members said. It had been unclear whether these jets broke through the debris shell created by the original explosion. But the observations by Mooley and his team — made 75 days and 230 days after the initial detection of GW170817 — indicate that this did indeed happen. At first, the jets interacted with the expelled debris to form a sort of cocoon, which moved much more slowly than the jets themselves. But the jets eventually broke free into interstellar space. "Our interpretation is that the cocoon dominated the radio emission until about 60 days after the merger, and at later times the emission was jet-dominated," study co-author Ore Gottlieb, a theorist at Tel Aviv University in Israel, said in the same statement. This illustration shows the aftermath of the neutron-star merger. Ejecta from an initial explosion formed a shell around the black hole formed from the merger. A jet of material propelled from a disk surrounding the black hole first interacted with the ejecta material to form a broad "cocoon." Later, the jet broke through to emerge into interstellar space, where its extremely fast motion became apparent. Now for the faster-than-light part: In the 155 days between the two observations, the jet pointing toward Earth seemed to jump ahead by 2 light-years — a distance that suggests it was traveling at four times the speed of light. But again, this was just an illusion. The new results suggest that neutron-star mergers are important sources of short-duration gamma-ray bursts, study team members said. Merger-generated jets need to be nearly aligned with Earth for these eruptions of high-energy light to be detected, they added. “The merger event was important for a number of reasons, and it continues to surprise astronomers with more information,” Joe Pesce, NSF program director for NRAO, said in the same statement. "Jets are enigmatic phenomena seen in a number of environments, and now these exquisite observations in the radio part of the electromagnetic spectrum are providing fascinating insight into them, helping us understand how they work." The new study was published online today (Sept. 5) in the journal Nature.